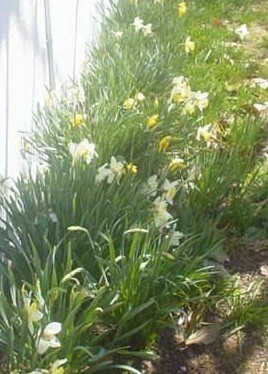 My cousin, Ruth, took this picture of the daffodils by her garage. Her picture inspired this post. When I was a little girl, I spent a lot of time with my maternal grandparents. I loved spending the night at their house, sleeping in Grandpa’s undershirts (even when I brought my own PJs with me), drinking homemade milkshakes and baking fun stuff with Grandma. Days at Grandma’s—it was always Grandma’s house and Grandpa’s car to me—were full of endless rounds of “Go Fish”, Crystal Gayle records and swinging on the homemade swing in the big maple tree in their backyard. I’d jump rope on the back porch, roller skate in the basement and type nonsense on Grandpa’s typewriter. It was good to be a kid at Grandma’s. It’s true that my grandparents spoiled me, but they also loved me in a special way that no one else has ever loved me—before or since. Since my mom is an only child, my older brother, Kevin, and I were Byron and Vivian Long’s only grandchildren. They had grown up in a small town called Rector, Arkansas, and moved to St. Louis when they got married in 1941 so that my grandpa could get a job up here. Grandma was a housewife. She never learned to drive, so Grandpa took her everywhere she went. She was reserved, a little shy even, but with us kids she completely showered us with affection. Grandpa was one of the most selfless, genuine people I’ve ever met. He had a silly side that always delighted me. When our visits would come to an end, he’d do silly, waving dances for us in the driveway until the car was out of sight. He was smart, too, and was one of those people that if you asked him a question he didn’t know the answer to, he’d find a way to look it up. Keep in mind this was 35 years before the internet. Grandma and Grandpa always had a small garden in their backyard. I remember chasing away the bunnies that would eat the little yellow flowers on the cucumber plants. One year, though, they had a rabbit Grandma called Bunnikens. They let the grass grow long in the yard where Momma Bunny kept her nest. Every Spring Grandma’s house would have flowers all around. The back of the house had a huge snowball bush as tall as the house. In the front there were always daffodils that Grandma called yellow jonquils. They were the bright yellow ones. I loved those flowers, and Grandma would always cut me a bunch to take home. She’d wrap up their stems in wet paper towels and put aluminum foil around them so I could take them home with me. It felt like I was taking a little bit of Grandma’s house with me. Years later, after my grandparents passed away, my parents and I had the task of cleaning out their house and putting it up for sale. Grandma had died in 1996, and Grandpa lived almost ten more years, living out the last few of them with my parents in their home. Needless to say, the landscaping in front of Grandma’s needed some attention; except in early Spring when the daffodils were in bloom the area by the front porch needed some color. In the fall of 2005 when we listed the house, I dug up as many of the bulbs as I thought I could find a spot for at my house and replanted some tidy, boring shrubs in their place. The bulbs stayed in a bag almost two years. I never got around to planting them at our house, which turned out to be a blessing because we moved the next summer into a new home where I finally planted them. Every year they pop out in front of the garage. Today they are all covered with buds, ready to open this week. I love seeing those daffodils come up because they don’t care if it’s a long, cold, snowy winter. They still come up—even in snow—their yellow heads a joyous golden testimony to the inevitable Spring. The unassuming daffodil will always be my favorite flower; its simplicity reminding me of the unconditional love of two of my all-time favorite people and a time when happiness grew in bunches by the front porch. 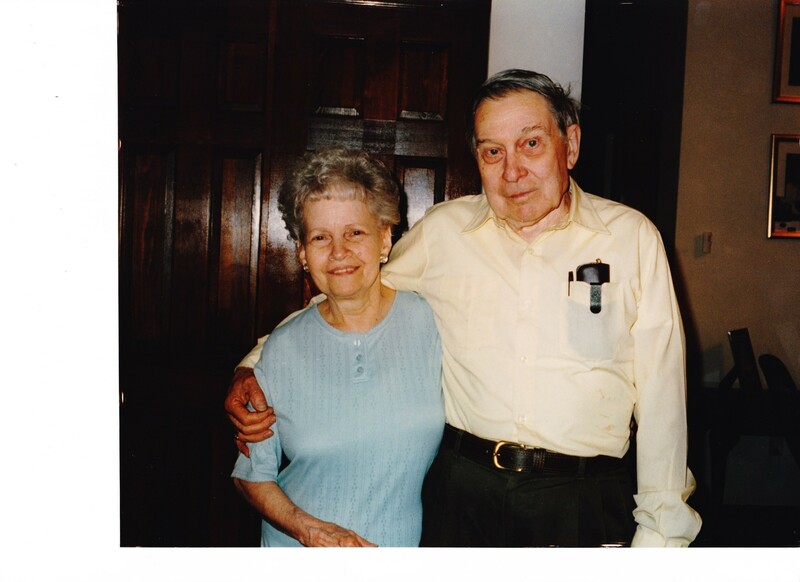 Grandma and Grandpa Long–still two of my favorite people who ever walked this planet! Ruth, I’ve never heard that story before. I was only 3 or 4 when Eldo died, but I still remember him for his love of books. I also have kept and have dog-eared the copy he wrote about all the crazy relatives in our family. I have tried to do something similar for my kids, but it pales in comparison to his. I love how nature and family seem to go hand in hand. Without sounding totally “pun-like” I guess its the “roots” concept. Amy, you put down roots. And that action is beautiful. I often tell my boys that any relationship takes care and from that care and love springs life. Kinda deep–but the boys get it and I hope they see family as the special blessing it is. I agree, Kim. Family, with all of it’s annoyances and over familiarity always seems to be what I come back to.